Kyrgyzstan must introduce the death penalty – it is more “humane and economically viable” than a life sentence, said social democrat fraction MP Erkin Sakebayev on 4 December at a meeting of the committee on law, safety and crime fighting, KYRtag reports. A life sentence means a slow death, why torture them like that? I think it is much more humane to introduce the death penalty. In the USA, for example, criminals are executed on the electric chair. 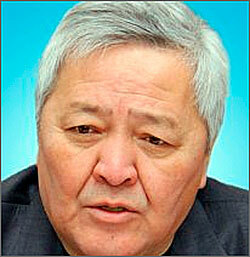 Why don’t we introduce the same method?” Sakebayev suggested. The socialist democrat MP believes that this measure will also be economically beneficial for the government. “Today, to build a colony for people serving life sentences, we need 300 million soms (over $6.3m). When our children study in tents, we must build schools or colonies for criminals?” said the MP. The life sentences most recently given out in Kyrgyzstan are mostly to do with the tragic events of June 2010. One of the life sentences is being served by Azimjan Askarov, who won the prestigious international prize for the freedom of speech from the Committee to Protect Journalists this year. He said that the moratorium on capital punishment was introduced in 1998 in Kyrgyzstan, but came into effect only in 2002. “This decision improved the image of our country, got approval from the world community. A reverse decision will be a hit to our country. We are positioning ourselves as a democratic parliamentary republic – the first in Central Asia,” said the ombudsman. More than 260 people are serving life sentences in Kyrgyzstan’s penal colonies. Around 40 of them were sentenced after the tragic disturbances in Osh and Jalal-Abad in June 2010, including Azimjan Askarov. Top lawyers believe that the accusation against Azimjan Askarov is false and view it as nothing other than revenge from the security services. Executive director of the “Citizens against Corruption” centre Tolekan Ismailova believes that party lists have been the cause of an uneducated parliament, where 65% of the MPs do not know what human rights are, discriminate by gender and ethnicity, and do not even understand the terms of international law.